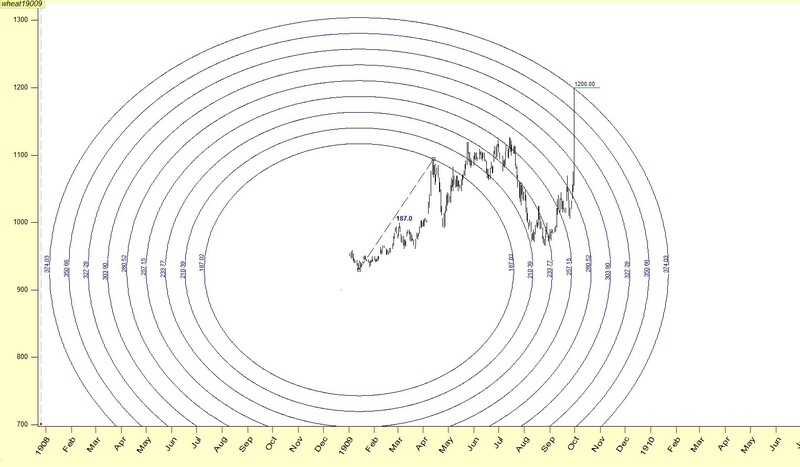 Gann insisted on using scaled charts, because he was using his compass to draw vectors from highs to lows and vice versa. Another reason for which he wanted them properly scaled , was that he layed overlays which had the paths of the planets. One instance he used all of these techniques was the famous Wheat 1909 call he made . 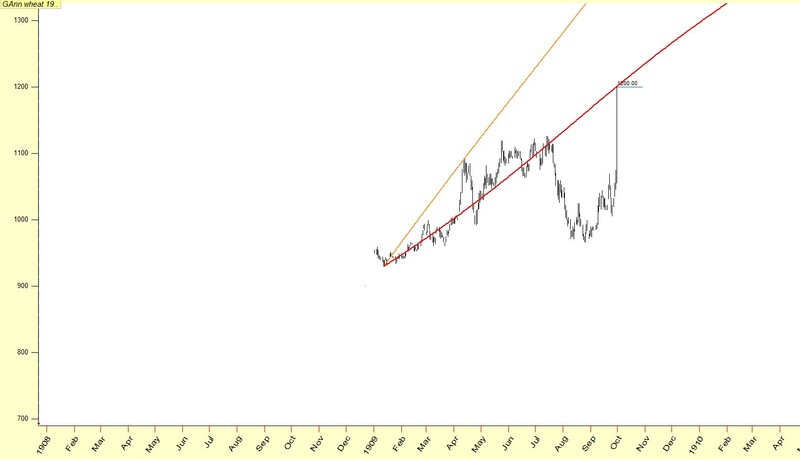 He said, that if by the end of the trading day of September 29th 1909,Wheat September would not reach 1.20 $ ,then it would prove that there was something wrong with his method. 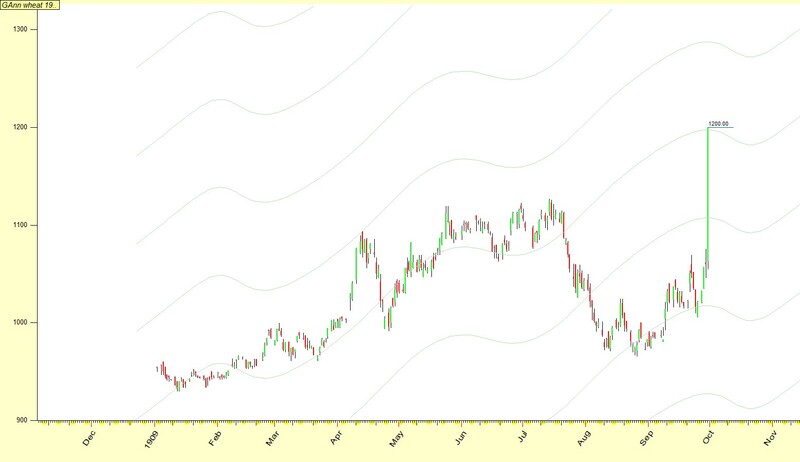 This is the chart of wheat September 1909. 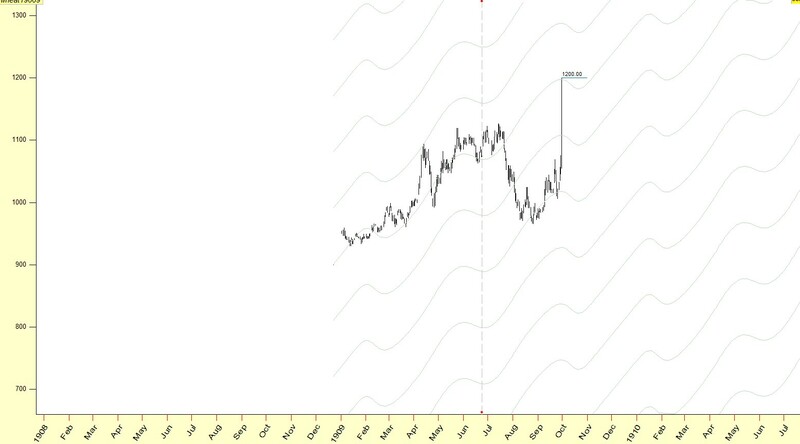 January the 13th 1909, wheat made a low price of 930. 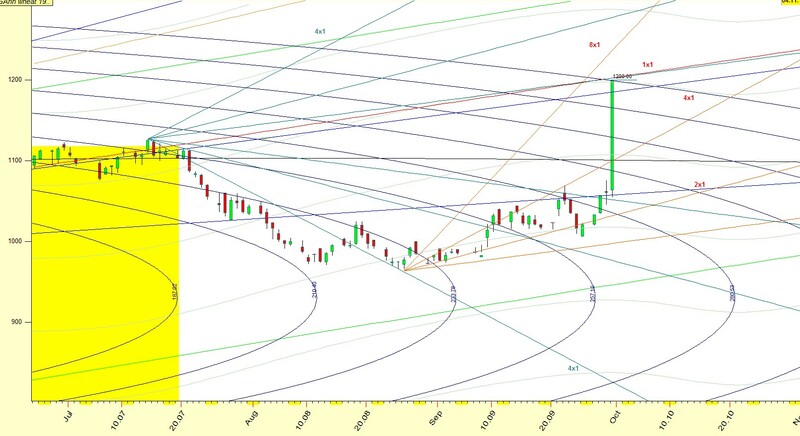 As days progressed, Gann was following the mercury planetary lines(gray) and its harmonics (4th ). 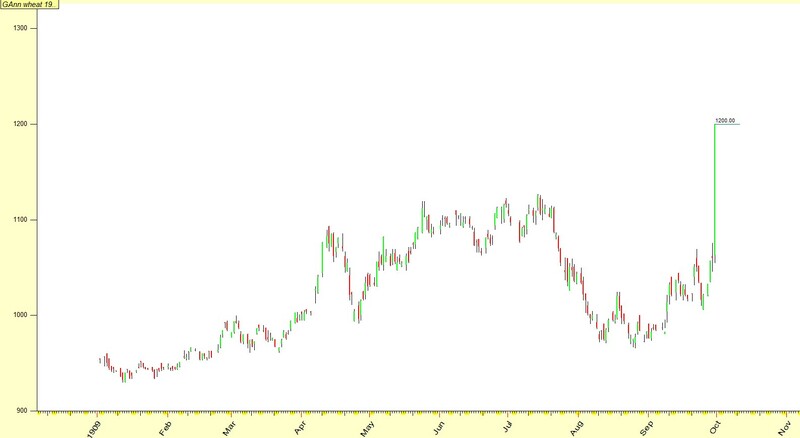 At April 13th 1909, wheat reached a price of 1094. 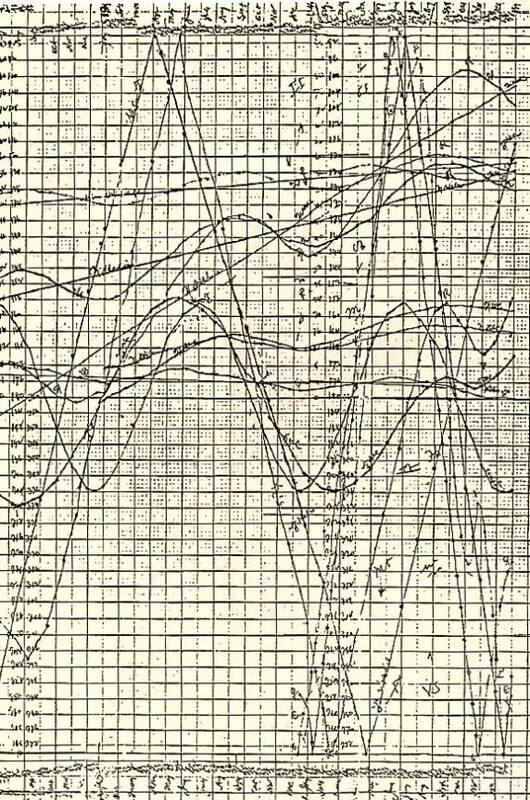 That was 90 calendar days from the low of January 13th 1909. 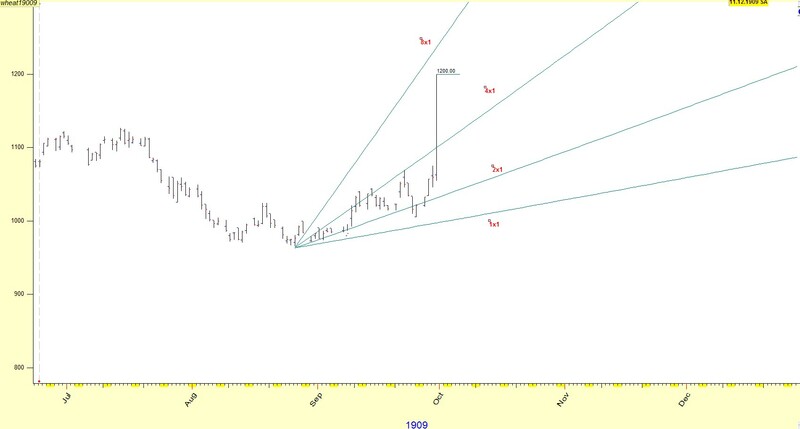 A time period which Gann was following in all markets. He was probably short from then on , as it was a critical day for various reasons. In many of his books, he would call a price level as a natural level. That was a name he gave to points in space , where a planetary configurations would occur. It could be a solar or lunar eclipse, and at other times it could be just a planetary aspect between planets in the geocentric or heliocentric system. Venus and Saturn were conjunct at 13’30’ degrees of Aries, in the Heliocentric system. Quite a day , as these degrees are not only close, but they convert to the high price of the day. 1094 -360-360-360 or 1094 minus 3 times the circle of 360 degrees ,equals 14. 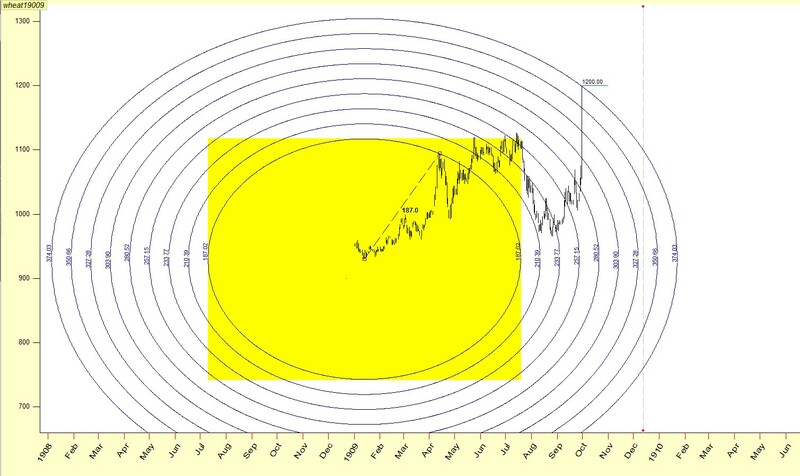 From then on ,as time progressed, Gann was more than sure that these two points, the January low and the high of April 13th were connected in a geometrical way. He measured the distance from the Low to the High with his compass, and from there he expanded. Depending on the scale he used for that contract (it could be from 4x4 to 32x32.We don’t know .We do know whether he used 1 point for 1 period or 10 point for 1 period). Suppose that he charted with 1 inch for r 10 points that would give him a radius of 18.07 inches. He was fond of 8ths, as these represent the octave. 1.125 1.25 1.375 1.5 1.625 1.75 1.875 and finally 2, being one octave. Here you can see the 187 units expanded , by these ratios. 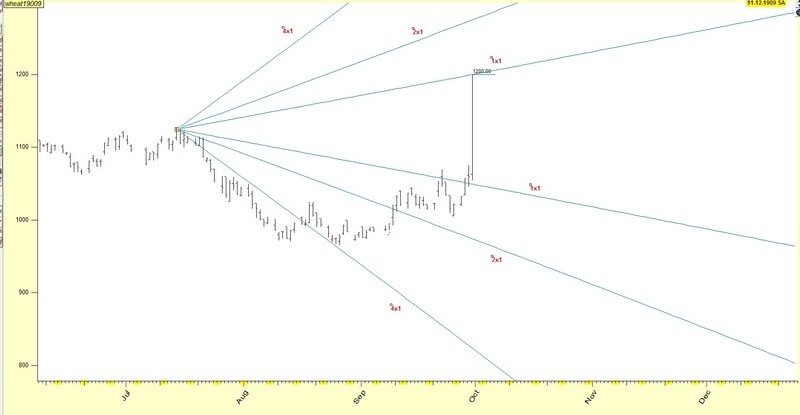 You can already see ,the 1200 price being “hit” by mercury and the 200% expansion of the 187.1 vector. 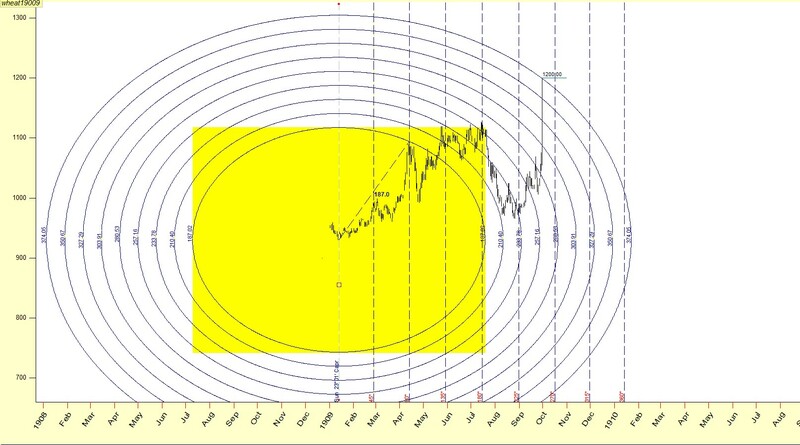 Gann used always his layers on top of his properly scaled charts. 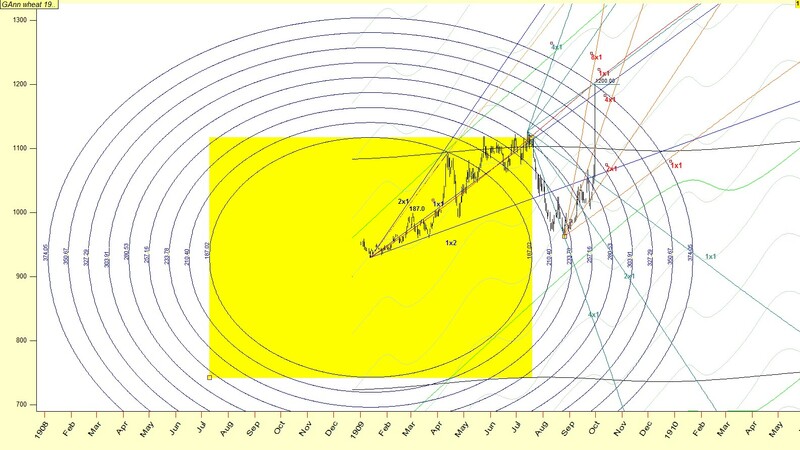 Price reversed at July 14th, 1909 ,and from there Gann as always, used his 1x4 1x2 1x1 2x1 and 4x1 angles from that top,in order to catch the low. Since 1 point per 1 period in the daily, is close to 1 point per 1 degree of Earth-Sun ,he used that. travelled from the High of July 14th 1909 and caught the price at August 24-25 1909. From there on he would use again the SUN angles from the low of August 26th 1909 . 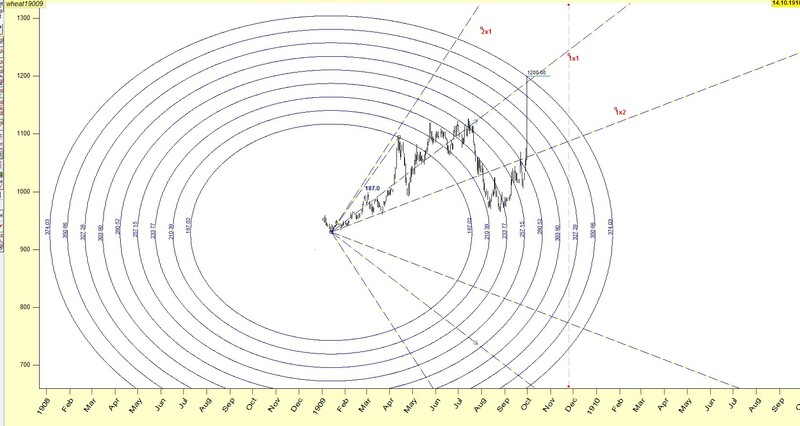 These are typical Gann setups. Lets go back, and see piece by piece what we have so far ,and finally add the “Missing” element wich solves the 1909 Wheat Call. 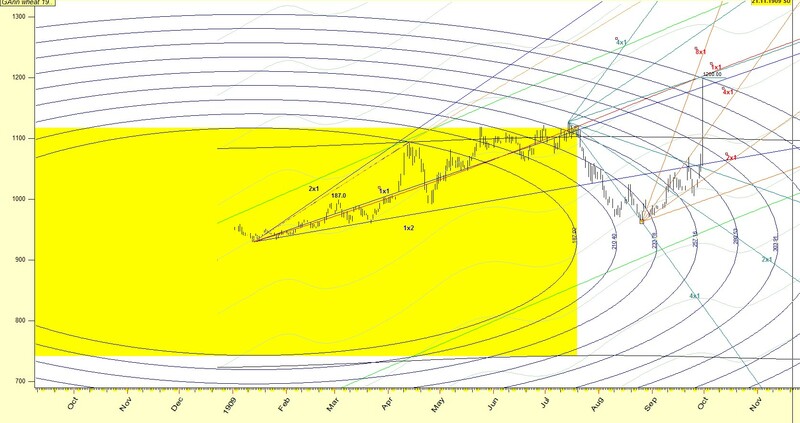 Gann setting up with his compass, vectors. 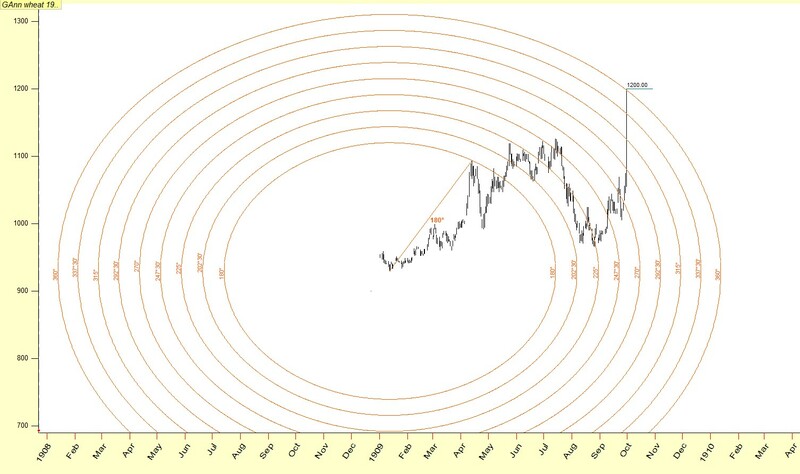 He have seen the setup once the high of April was reached, due to mercury conjunct Saturn(geocentrically) and Venus conjunct Saturn (heliocentrically). I have left the good part for the end. 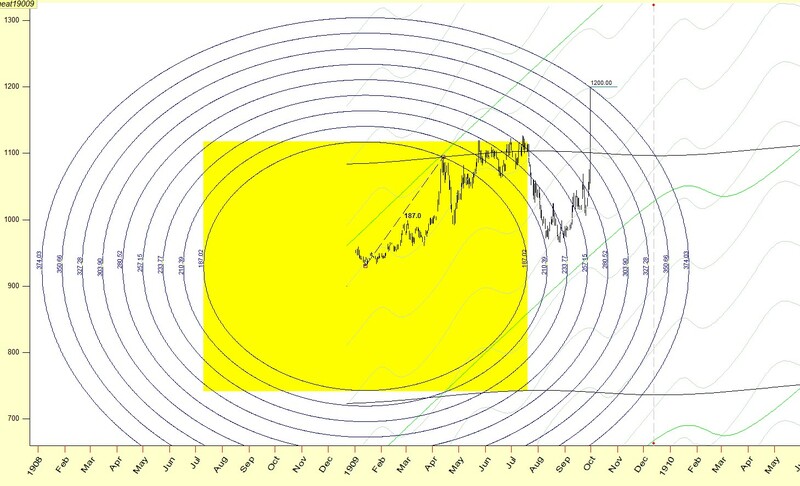 The setup for Gann’s campaign was set with the mercury planetary lines. Many of you have noticed that rarely 2 planets set the scene in the market. Below you will see what I mean. Assigning 1.0569 point per 1 degree of SUN we have the vector of 180(instead of 187) and expanding we arrive at the double (the octave) at 360.
we get the price of 1200 at September 29th approximately.